That had a to do with the game itself, of course. For anyone who watched, but especially for those of us in the stadium, the overtime win over Wisconsin felt like a just reward for a team that had been through so much and had earned the right to finish on a high. But mostly, it was about the seniors. 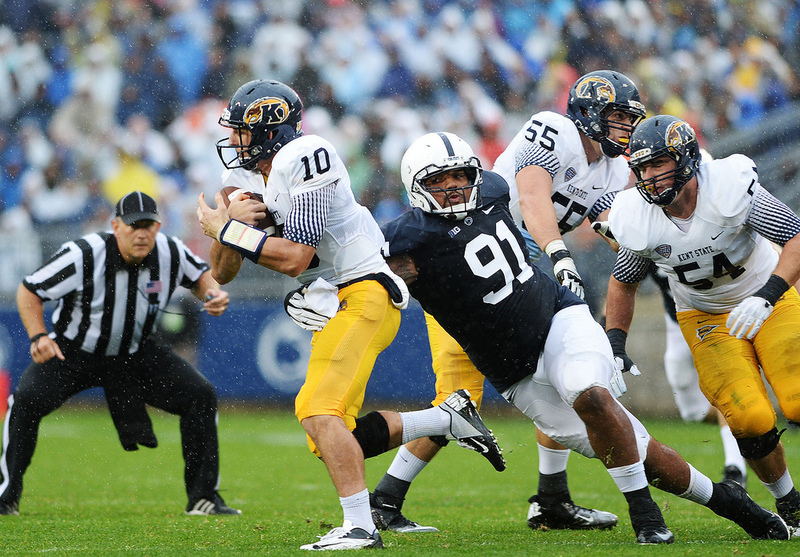 Michael Mauti ’13 was the heart and soul of that group, and their collective leadership—in words, but more importantly in actions—kept the Nittany Lions together from the gut-punch of the sanctions and through a difficult start to the season. The “42” on every players’ helmet in the season-finale was for the injured Mauti, of course, but—as the “2012” on the stadium’s east side reminds us—that gesture was ultimately about remembering the entire class. Tomorrow, we’ll honor the 2013 senior class, a group that’s every bit as deserving of our appreciation—in some ways, even more so. There may not be a fiery, outspoken leader like Mauti in the group, but this year’s senior class if full of players who have been vital to the Lions’ success in what has proven, on the field, to be an even more challenging season. With far less depth and experience around them, the 2013 class has had to carry an even heavier load. Guys like DaQuan Jones (pictured) and Glenn Carson ’13 had to help make up for the loss of NFL draft picks, and with limited scholarships, they had a lot less help. The Lions’ personnel limitations also meant players like Garry Gilliam and Stephen Obeng-Agyapong ’13 have spent their final season playing out of position, a challenge few players would want, let alone embrace, at this point in their careers. As much as last year’s seniors were rightly praised for sticking around in the wake of the sanctions, it would have been even easier for members of this year’s class—less entrenched in the program, with less time and sweat invested—to bolt when they had the chance. Guys like John Urschel ’12, ’13g, the model student-athlete, would have been coveted by any program looking to boost the strength of its offensive line (not to mention its team GPA). And how much more difficult might Christian Hackenberg’s terrific freshman season have been if he didn’t have a crew of senior linemen—Gilliam, Urschel, Adam Gress ’13, Ty Howle ’12, and Eric Shrive—working to protect him? They could have left. All of them. But they stayed. And they deserve a full house on Saturday. So bundle up, get out there early, and stay to the end. Don’t let the weather, or the fact that there’s no bowl game to look forward to, be an excuse. These seniors haven’t made excuses, and they’ve earned our attendance—and our thanks. This entry was posted in Uncategorized and tagged Christian Hackenberg, DaQuan Jones, Garry Gilliam, Glenn Carson, John Urschel, Michael Mauti, Nebraska, Seniors, Stephen Obeng-Agyapong, Wisconsin. Bookmark the permalink.